Just came back from craziest jogging adventure ever!!! 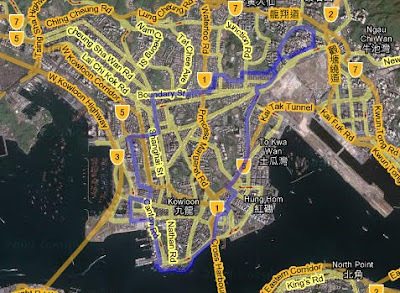 Original plan was to go run from Mong Kok to Tai Kok Tsui and run around the park. But then just ran with the flow came out at Kowloon and pretty fast went to Tsim Sha Tsui and found out that Hung Hom is like just few streets away and then ran to Ngau Tau Kok, but from there I had planned to run to Mong Kok , but then got lost and came out at Daimond hill and even got to Raibow. Then use the mountains to guide me to Kowloon city and finally found Boundary street and ran to Prince Edwards and then went finally back to Mong Kok. Damn I donno how much KM I had made but pretty much ran like a marathon. I am now feeling that HK is much smaller than I had thought. Just placed the route on Google maps and in total it is about 17,57KM. There are actual not allot of signs in Hong Kong that would like say where you are or actually show a map of the city. This is majorly annoying and also make it easy to get lost, you can only try to find your way to search for a highway which does got sign saying which way to which city. But I rather see maps of the city hanging around the city so people can easily go where they want with out asking people or having to carry a map by them self. In the Netherlands I can easily find my way cause I there are enough signs and maps around that I can easily find my way back this way pretty much first time I really got lost cause I went to a place that I have never been before and had no one to guide me, luckily still managed to get home. Next run I will document it with some pictures. I am now pretty sure I could walk from Kowloon or Mong Kok to Shatin. Will show that if you have no money to get on any public transport and if you phone is dead, that you still can cross the Lion Rock Mountain to get home.